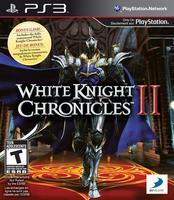 White Knight Chronicles II is not only a sequel to 2010's White Knight Chronicles: International Edition, but it also includes a remastered version of the International Edition as well. The sequel has players once again exploring the fantasy kingdom of Balandor as a heroic character known as Leonard. Changes to the game include more than 400 weapon and armor options, more skills and spells to choose from, and an improved active turn-based battle system that incorporates new strategic options. In addition to the single-player content, White Knight Chronicles II includes online play for up to six friends or family members. Online players can customize their avatars, choose from an assortment of quests to complete, or even create their own towns to sell exclusive items and materials to visitors. The publisher estimates that the two games in this collection feature more than 100 hours of content combined.